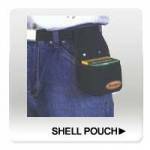 These convenient and comfortable pouches belt snugly on your hip, allowing for easy access to shells and providing ample room to store empty hulls. All pouches feature a quick-zip bottom to quickly unload contents. Constructed of nylon/canvas with stylish accents Adjustable waistband and contoured for comfortable use Divided compartments for loaded shells & empty hulls Embroidered with the Federal Premium Ammunition and Champion Traps & Targets logos ..
Blackhawk Buttstock Open Shotgun Shell Holder. This elastic sleeve slips over shotgun buttstocks for quick ammo access. Black elastic. 5 loops. Open Style Sewn-on elastic loops keep ammo in place Shotgun includes five ammo loops. ..